Definition at line 39 of file CQSpecieDM.h. Definition at line 22 of file CQSpecieDM.cpp. References CModelEntity::ASSIGNMENT, CModelEntity::FIXED, FROM_UTF8, mItemToType, mTypes, CModelEntity::ODE, CModelEntity::REACTIONS, and CModelEntity::StatusName. Definition at line 59 of file CQSpecieDM.cpp. Definition at line 111 of file CQSpecieDM.cpp. References COL_COMPARTMENT, COL_CONCENTRATION, COL_CRATE, COL_EXPRESSION_SPECIES, COL_ICONCENTRATION, COL_IEXPRESSION_SPECIES, COL_INUMBER, COL_NAME_SPECIES, COL_NRATE, COL_NUMBER, COL_ROW_NUMBER, COL_TYPE_SPECIES, flags(), FROM_UTF8, CMetab::getCompartment(), CMetab::getConcentration(), CMetab::getConcentrationRate(), CCopasiRootContainer::getDatamodelList(), CExpression::getDisplayString(), CModelEntity::getExpressionPtr(), CMetab::getInitialConcentration(), CModelEntity::getInitialExpression(), CModelEntity::getInitialExpressionPtr(), CModelEntity::getInitialValue(), CCopasiObject::getObjectName(), CModelEntity::getRate(), CModelEntity::getStatus(), CModelEntity::getValue(), CQBaseDataModel::isDefaultRow(), mFlagConc, mItemToType, mpSpecies, rowCount(), CCopasiVector< T >::size(), and CModelEntity::StatusName. 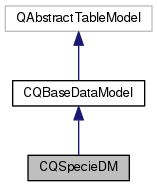 Definition at line 64 of file CQSpecieDM.cpp. References CModelEntity::ASSIGNMENT, COL_COMPARTMENT, COL_ICONCENTRATION, COL_IEXPRESSION_SPECIES, COL_INUMBER, COL_NAME_SPECIES, COL_TYPE_SPECIES, data(), FROM_UTF8, CCopasiRootContainer::getDatamodelList(), CQBaseDataModel::isDefaultRow(), CMetab::isInitialConcentrationChangeAllowed(), mpSpecies, and CModelEntity::StatusName. Definition at line 49 of file CQSpecieDM.cpp. Definition at line 39 of file CQSpecieDM.cpp. Definition at line 245 of file CQSpecieDM.cpp. References COL_COMPARTMENT, COL_CONCENTRATION, COL_CRATE, COL_EXPRESSION_SPECIES, COL_ICONCENTRATION, COL_IEXPRESSION_SPECIES, COL_INUMBER, COL_NAME_SPECIES, COL_NRATE, COL_NUMBER, COL_ROW_NUMBER, COL_TYPE_SPECIES, FROM_UTF8, CModel::getConcentrationRateUnitsDisplayString(), CModel::getConcentrationUnitsDisplayString(), CCopasiRootContainer::getDatamodelList(), and CModel::getFrequencyUnitsDisplayString(). Definition at line 479 of file CQSpecieDM.cpp. References ListViews::ADD, COL_NAME_SPECIES, ListViews::COMPARTMENT, CModel::createCompartment(), CModel::createMetabolite(), CQBaseDataModel::createNewName(), CModel::getCompartments(), CCopasiRootContainer::getDatamodelList(), CModelEntity::getKey(), CCopasiObject::getKey(), CCopasiDataModel::getModel(), ListViews::METABOLITE, mNotify, mpSpecies, CQBaseDataModel::notifyGUI(), CModelEntity::REACTIONS, CCopasiVector< T >::size(), and TO_UTF8. Definition at line 541 of file CQSpecieDM.cpp. References C_INVALID_INDEX, CQMessageBox::confirmDelete(), FROM_UTF8, CCopasiRootContainer::getDatamodelList(), CMetab::getDeletedObjects(), CModel::getMetabolites(), CCopasiDataModel::getModel(), CCopasiObject::getObjectName(), CQBaseDataModel::isDefaultRow(), and CQBaseDataModel::removeRow(). 555 //before actually deleting any item. Definition at line 507 of file CQSpecieDM.cpp. References CCopasiVector< T >::begin(), ListViews::DELETE, CCopasiRootContainer::getDatamodelList(), CModel::getMetabolites(), ListViews::METABOLITE, CQBaseDataModel::notifyGUI(), and CModel::removeMetabolite(). 533 emit notifyGUI(ListViews::METABOLITE, ListViews::DELETE, ""); //Refresh all as there may be dependencies. Definition at line 54 of file CQSpecieDM.cpp. Referenced by data(), and CQSpeciesWidget::deleteSelectedSpecies(). Definition at line 336 of file CQSpecieDM.cpp. References ListViews::ADD, C_FLOAT64, ListViews::CHANGE, COL_COMPARTMENT, COL_ICONCENTRATION, COL_INUMBER, COL_NAME_SPECIES, COL_NUMBER, COL_TYPE_SPECIES, ListViews::COMPARTMENT, CMetab::convertToConcentration(), CMetab::convertToNumber(), CQBaseDataModel::createNewName(), data(), FROM_UTF8, CMetab::getCompartment(), CCopasiRootContainer::getDatamodelList(), CModelEntity::getInitialValue(), CModelEntity::getKey(), CCopasiObject::getObjectName(), CQMessageBox::information(), CQBaseDataModel::insertRow(), CQBaseDataModel::isDefaultRow(), ListViews::METABOLITE, mFlagConc, mItemToType, mNotify, mpSpecies, CQBaseDataModel::notifyGUI(), CMetab::setInitialConcentration(), CModelEntity::setInitialValue(), CCopasiObject::setObjectName(), CMetab::setStatus(), CModelEntity::setValue(), CModelEntity::StatusName, and TO_UTF8. 387 // setInitialNumber to work correctly. 398 msg = "Unable to move species '" + FROM_UTF8(mpSpecies->getObjectName()) + "'\n"
399 + "from compartment '" + FROM_UTF8(CompartmentToRemove) + "' to compartment '" + FROM_UTF8(Compartment) + "'\n"
Definition at line 44 of file CQSpecieDM.cpp. Definition at line 59 of file CQSpecieDM.h. Referenced by data(), setData(), and setFlagConc(). Definition at line 65 of file CQSpecieDM.h. Referenced by CQSpecieDM(), data(), getItemToType(), and setData(). Definition at line 72 of file CQSpecieDM.h. Referenced by insertRows(), and setData(). Definition at line 70 of file CQSpecieDM.h. Referenced by data(), flags(), insertRows(), and setData(). Definition at line 60 of file CQSpecieDM.h. 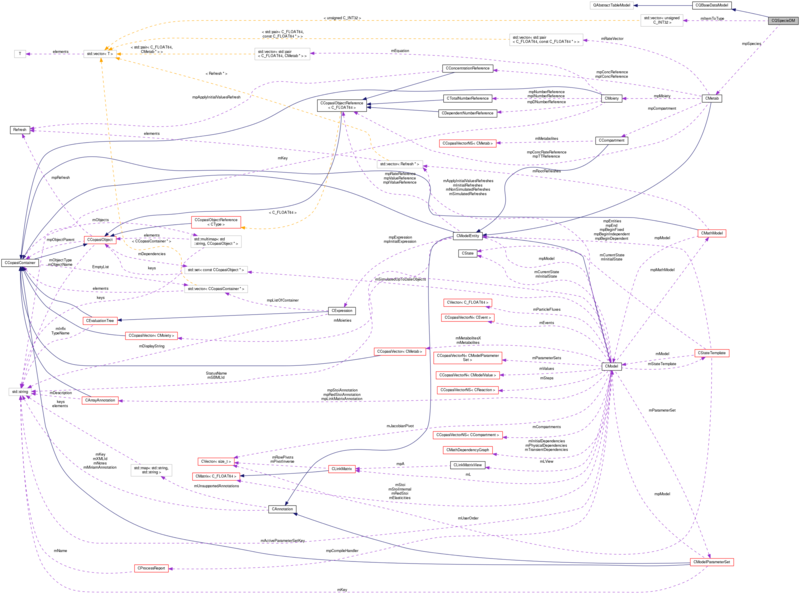 Referenced by CQSpecieDM(), and getTypes().